The original article can be found online at https://doi.org/10.1007/s00380-019-01365-6. 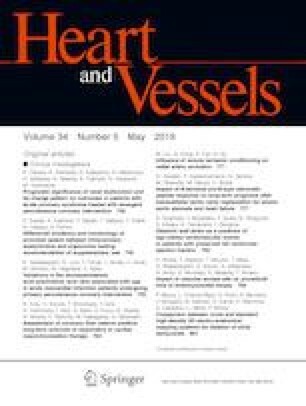 In the article “Cell salvage processing of residual cardiopulmonary bypass volume in minimally invasive cardiac surgery” published in Heart and Vessels, there were several errors in numerical values. In section “Processing of residual blood and blood sampling” appearing under heading “Patients and methods”, “200 ml saline” appearing in the last sentence of the first paragraph has to be read as “500 ml saline”. In section “Patients’ demographic characteristics” appearing under heading “Results”, “17,743 ± vs. 18,440 ± × 103/μl” formula has to be read as “177 ± 43 vs. 184 ± 40 × 103/μl”. In section “Intraoperative data during CPB” appearing under heading “Results”, (control group, 26,463 ± ml vs. CS group, 23,854 ± ml) should be read as (control group, 264 ± 63 ml vs. CS group, 238 ± 54 ml). Under Table 2, data appearing in column 2 and 3 for CPB time (min) was published incorrectly as 15 ± 122 and 15 ± 025 the correct data must read as 151 ± 22 and 150 ± 25. And tha data appearing in Mechanical valve/tissue valve, is incorrectly published as 34/6 and 37/3 the correct data is 6/34 vs. 3/37. Also, In Table 4 Postoperative blood loss and use of blood products, data appearing in column 2 and 3 for 6 h after admission to ICU was published incorrectly as 115 ± 50 and 733 ± 3, the correct data must be read as 115 ± 50 and 73 ± 33.